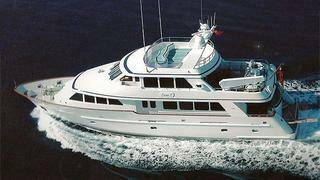 News in over the weekend from Emmett O'Donoghue that he's listed the 27m motor yacht Escape S for sale. Built in 2005 by Conrad Yachts to a design by Bill Dixon, she packs a surprising amount of space in her three decks. An interior in American cherrywood accommodates eight guests in four staterooms. Lying in Marmaris, Turkey, Escape S is asking €4 million.